CSL4SA Over the past 4 years I have written a good number of posts in the CSL4D blog on various aspects of the systems approach (or systemic agency). 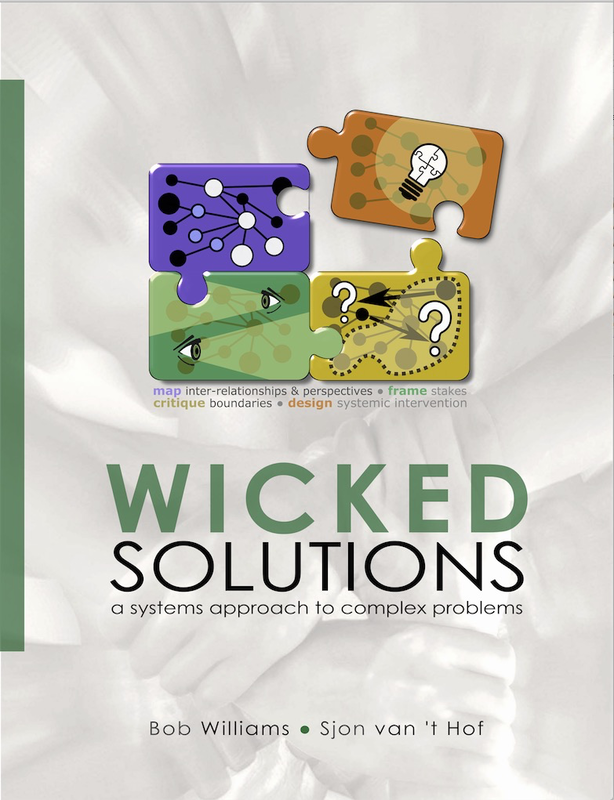 In this post I will re-arrange more than 30 of them, to provide a more or less coherent body of theoretical insights underlying Wicked Solutions, a practical book – in fact, a work book – about the systems approach. Along the way you will learn why “it is tempting, if the only tool you have is a hammer, to treat everything as if it were a nail.” (Maslow, 1962). Make sure you do not give in to that temptation! It’s a wicked problem, stupid! What’s the link between wicked problems and systems thinking? The take-away message is that although wicked problems are not ‘normal’, they are so common that it is very important for everybody to understand that they need an approach that differs fundamentally from the ‘normal’ approach. This is very difficult for many, many people to accept and even if they accept it, their Pavlovian conditioning is so strong that they cannot stop themselves from hammering away at wicked problems with the standard linear problem solving tools they have been taught to place their belief in. What’s the systems approach? The systems approach is an idea that was first developed and explicated by Churchman, although it may well have deep, historical roots. Churchman wrote that “on the broadest level, the systems approach belongs to a whole class of approaches to managing and planning our human affairs with the intent that we as a living species conduct ourselves properly in this world.” That’s pretty broad, indeed. And very Kantian: ‘the good will’ (This also implies that for Kant’s good will to be effective, it must apply the systems approach. Not many philosophers seem to realize that, see e.g. Allen Wood’s piece on The Good Will.) And Churchman was right: for human action to make sense, we must want to do the right thing. Our usual approach is to narrow down our problems, so that we can manage them. As a result we commit what Churchman calls ‘the environmental fallacy’. Systemic wisdom versus statistic evidence: Can evidence-based and systemic change be combined? The systems approach is value-based: But why are values so important? Why wicked solutions? Churchman never formalized his systems approach, which makes it difficult for learners and specialists alike. Meanwhile other systems approaches were developed by others. Out of a mix of these Bob Williams, the main author of ‘Wicked Solutions’, distilled a series of steps that roughly follow the principles and ideas Churchman described in his trilogy (The Systems Approach, The Design of Inquiring Systems, and Enemies of the Systems Approach). Bob organized the steps around three basic systems concepts: inter-relationships, perspectives and boundaries, see also his comment of March 12, 2016. He figured that by doing so the systems approach would become accessible to everybody, learners in particular. That’s probably why he liked to work with me on Wicked Solutions as a co-author. I couldn’t make any claim to any expertise in the matter (but perhaps I can now?). The essence of the systems approach: How does ‘Wicked Solutions’ work? Why isn’t the systems approach applied more often? So far we have seen three reasons for not applying the systems approach: (a) people are strongly conditioned to the use other approaches, even if they obviously produce wrong results; (b) people are unable to recognize wicked problems (often because they don’t know what It is), let alone understand that the systems approach is needed; and (c) the systems approach isn’t some obvious, highly structured methodology that one can follow to come up with perfect answers. There are no perfect answers in the systems approach, which is perhaps a fourth reason why people don’t apply it. Some problems with the systems approach: Why isn’t it applied more often? Learning from failure: Can a systems approach help? Anti-planning: Is anti-planning a valid alternative to the systems approach? An interesting case of a ‘wicked problem’ is the Ukraine referendum in the Netherlands. People are exchanging arguments in favour and against the EU Association Agreement with Ukraine, without recognizing that never a set of arguments ought to ever convince anybody of one line of action or another in the case of a wicked problem, i.e. without investing in each other’s perspectives. It is only by looking at things from the vantage point of the complex whole that we can make sense of it. So one’s idea about whether the EU is on the right track or definitely not is part of the ‘equation’ (and it isn’t an equation, of course, because it is not exact science, but value-laden), no matter what proponents or opponents say about the validity of considering such an ‘environmental’ factor. The link with design The systemic design and innovation of interventions presents a great deal of similarities with design broadly. When I write ‘link’, I actually mean ‘intricate relationship’. Churchman points out that the systems approach can also be applied to design and inquiry in the broadest sense, including philosophy and theology. The Design Way may seem a bit arcane at first, but to me it is one of the best thought out books on a complex topic that I have ever read. It is interesting to note that the two authors, Harold Nelson (who has actually worked with Churchman) and Erik Stolterman are from very different lines of work: architecture and human interface design. This once more goes to show that systems thinking is profoundly generic in nature, yet highly applicable in practice. Some related approaches I wrote some stuff about related systems approaches. CSH is important because of parts of the critique, SSM is important because of certain ways for describing a problem (or rather a problematic situation, because the term ‘problem’ suggests one can know the wicked problem before it is solved). Where is the systems part in SSM? Theory for practice After editing existing and addition of new material it would seem that these blog posts could easily fill a small book on the theory for practice of the systems approach. Maybe one day it will be written as a useful complement to Wicked Solutions. Meanwhile, this overview should be enough theory for most of your systemic intents and purposes. What is more important is to demonstrate the applicability of the systems approach as described in Wicked Solutions in practice. This will raise new questions and produce better methodological insights to further guide the design of the new book. Any progress in this sense will be reported about in the CSL4D blog.